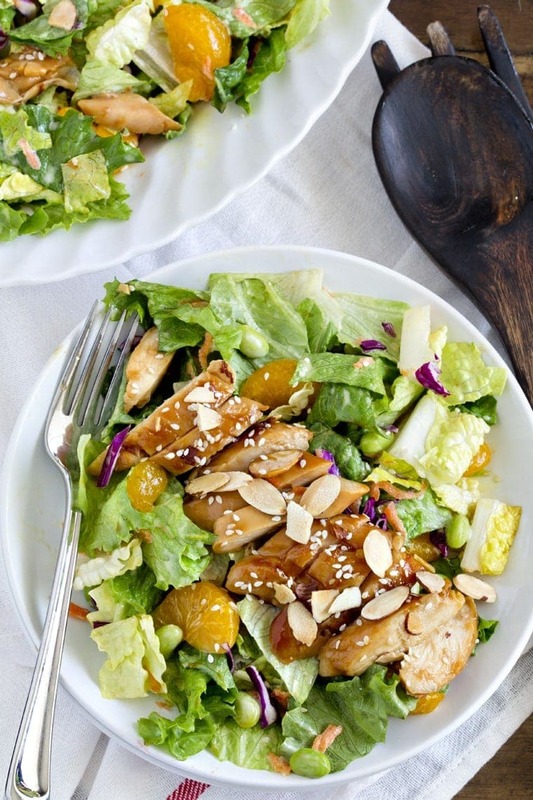 This Teriyaki Chicken Salad is my take on Red Robin’s Banzai Salad. 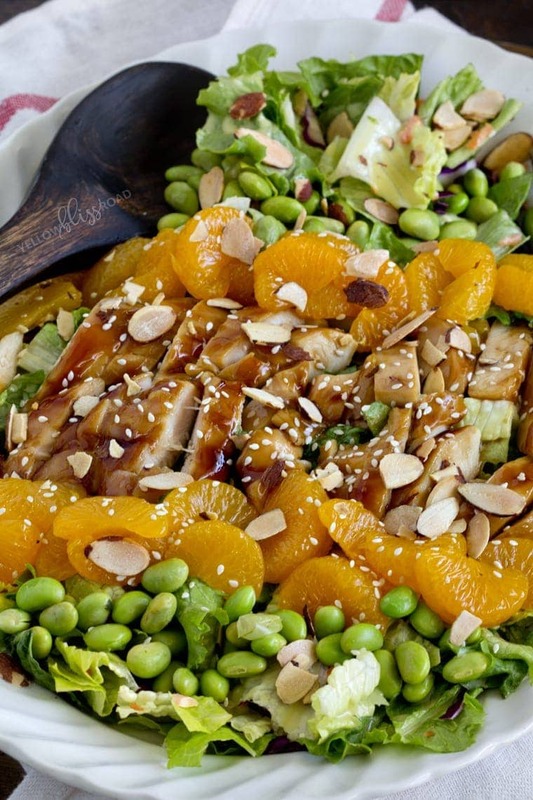 It’s got sweet teriyaki chicken and mandarin oranges, toasted almonds, edamame and a creamy honey mustard dressing. I’m not ashamed to say that we eat out at Red Robin probably 3 times a month, maybe more if you count the occasional lunch. It’s close, it’s reasonable and it has food that we all love (those fries though, mmm!). Last summer they introduced some new menu items and I hesitantly tried the Banzai Chicken Salad. 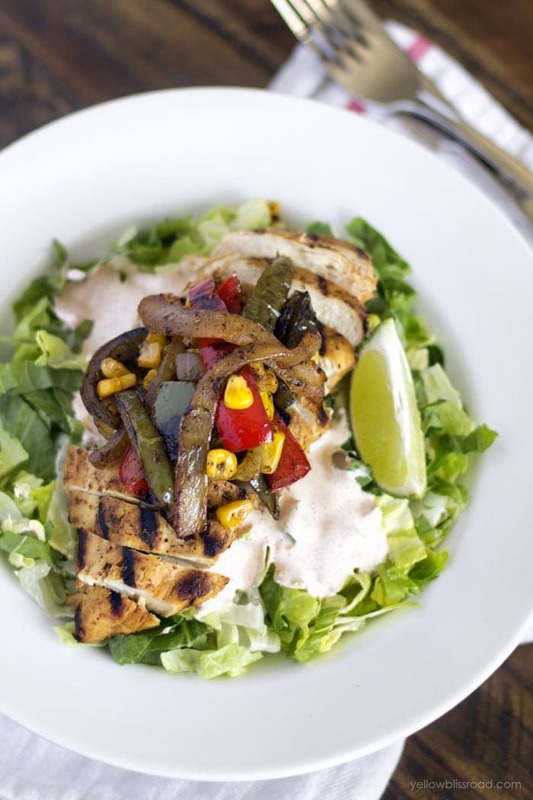 It’s got grilled teriyaki chicken, and a sweet and tangy honey mustard dressing. Never in a million years did I think I would fall in love with this chicken salad, but holy smokes! It quickly became my favorite. A few weeks ago I decided that I needed to come up with a recipe at home so I could have it more than 3 times a month! I searched for a copycat of their honey mustard dressing, and combined a few recipes to come up with one I really liked. 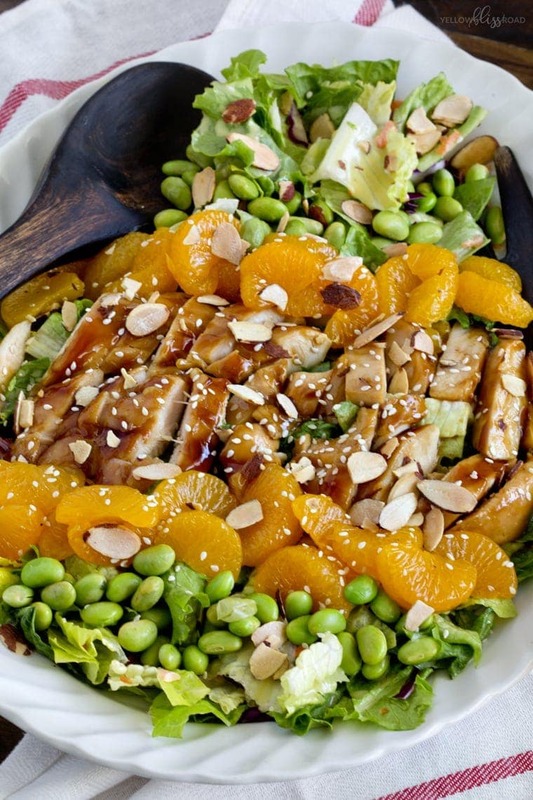 I added edamame to my salad for some extra protein and crunch, and topped it with toasted sesame seeds and almonds. The teriyaki sauce is sweet and sticky and gives a nice smoky flavor to the chicken, while the oranges provide a soft and sweet element. 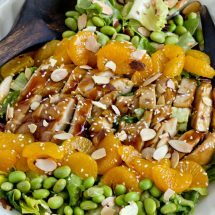 The toasted almonds and sesame seeds give a great texture and the honey mustard dressing is just the right combination of creamy, sweet and tangy. Perfection! Combine chicken and teriyaki sauce in a sealed ziploc bag and marinate for at least 30 minutes. Preheat oven to 400 degrees. Line a baking dish with foil (optional - for easy clean up). Arrange chicken in the baking dish and cook for 10-20 minutes, depending on the thickness of the chicken. Cool before serving. Combine ingredients in a tighly sealed container (like a mason jar) and shake until well combined. Alternatively, whisk ingredients together in a small bowl. Refrigerate until ready to serve. Toast the almonds and sesame seeds on a baking sheet in the 400 degree oven after chicken is done for about 5 minutes. Combine lettuce, carrot, red cabbage and edamame. Toss the salad with half of the honey mustard dressing. Arrange salad on a large platter or divide onto plates. 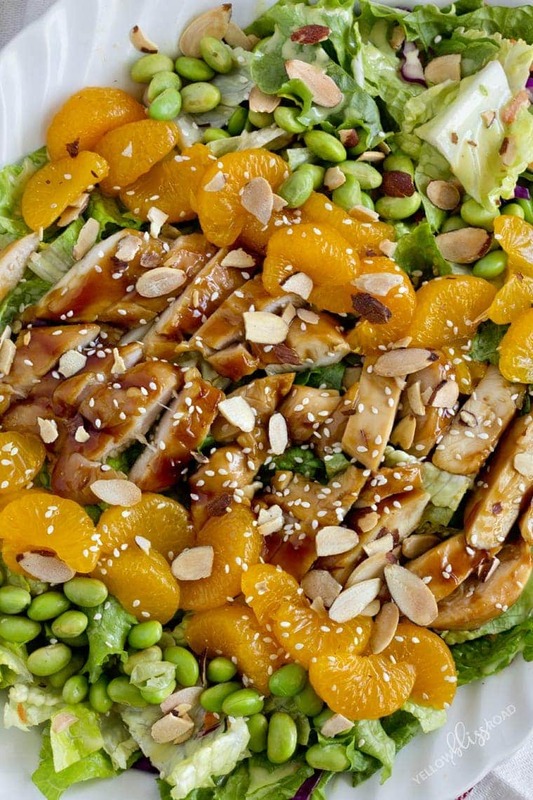 Top with sliced chicken, mandarin oranges, and toasted almonds and sesame seeds. 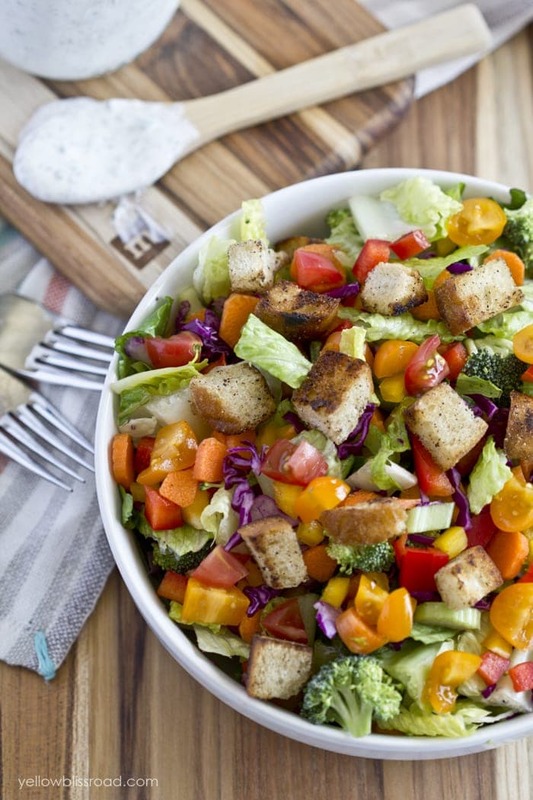 Drizzle with additional dressing or serve on the side. I just tried the Teriyaki Chicken Salad. It is amazing! 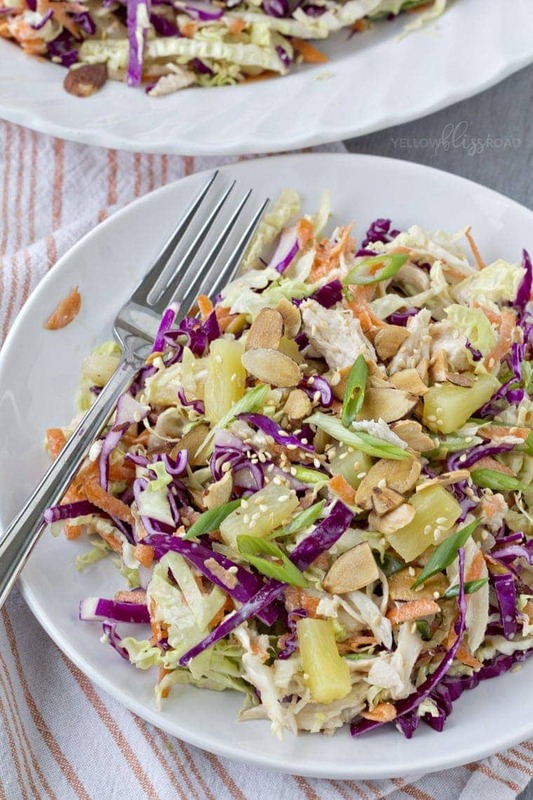 Very easy and tasty, reminding me of the Asian Chicken Salad at Applebee’s. The dressing is awesome. Rather than grate the carrot and cabbage, I bought a pre-packaged cabbage mix that contained red cabbage and carrots. 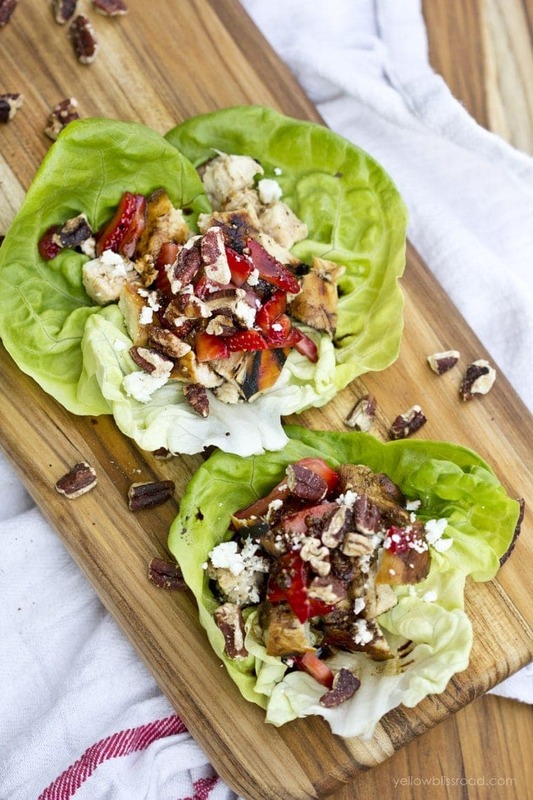 This is an easy to make, satisfying meal that is definitely going to be one of my favorites.